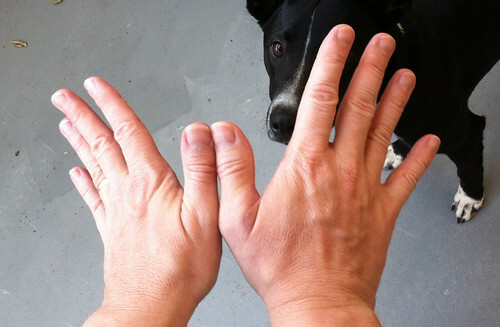 It’s time for a long-overdue thumb update. 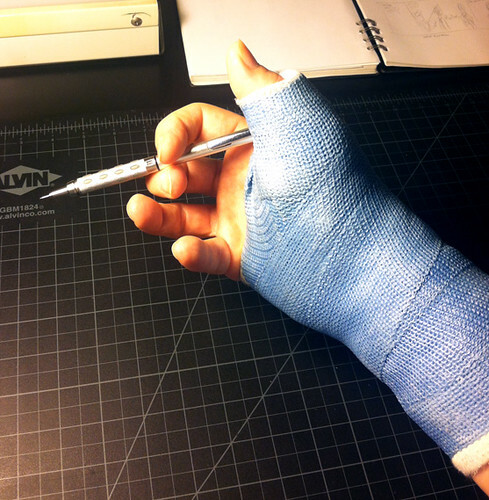 To catch you up to speed (or for first-time readers), here’s a brief recap: I fractured my drawing thumb in mid-November and had surgery on November 27. My hand migrated from cast to cast for about a month, after which I started two months of physical therapy. My top priority is getting my thumb back to normal. If you’ve ever had a sprain, strain, fracture or other debilitating injury, you know that physical therapy is vital to the recovery process. But even after two months of semi-weekly and weekly sessions, I’m still at about 90% of full mobility. I’m told by my surgeon (Dr. Bryan Leek) and my physical therapist (Angela Witucki) that this will likely take a year before all the excess internal scar tissue is reabsorbed, collagen returns (I think) and the tendons (or ligaments — I always confuse them) stretch back to previous limits. So for now, I have new limitations on my right hand — I can’t open my grip as far as my left hand and I can’t ball up a fist quite as tight as my left hand (see above). The biggest limitation is the tendon (ligament?) at my thumb’s first knuckle, the one just past the thumbnail. That’s been tightened to the point where it takes A LOT of warming up to get a decent bend out of it. This makes it somewhat difficult to write, draw and use an ink brush the way I used to, especially inking smooth arcs or writing the letter U (which ends up looking like a V). But that’s all inside stuff. From the outside, my right hand looks pretty normal. There’s an inch-long scar that runs alongside a slightly swollen knuckle, both of which should fade over time. I’ve been putting up new strips on an irregular basis. Once the cartooning gears of industry are grinding at full strength, you’ll see Cool Jerk back to a weekly schedule. Thanks for hanging in there! 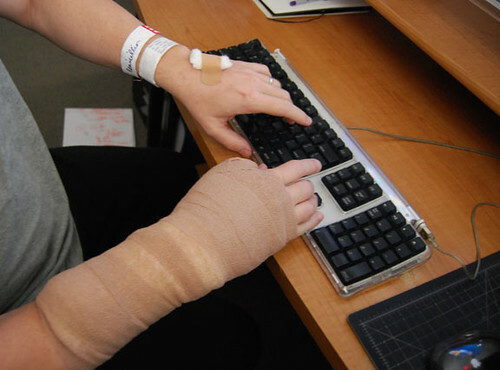 Last month, I fractured my right thumb. And yes, I’m right-handed. I was horsing around in a neighborhood park and fell in the grass, and, well… look up “Skier’s Thumb” and you’ll see what happened. 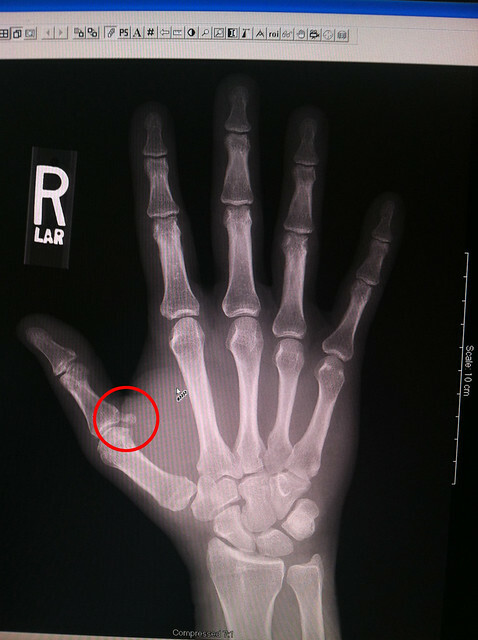 I initially thought it was a sprain but x-rays show that the ulnar collateral ligament didn’t snap, but instead it ripped free from my first metacarpal, taking some bone with it. That means surgery. So I had surgery two weeks ago. Very expensive (even with my insurance; more on that in upcoming blog posts). My post-op hand cast was made of ACE bandages, gauze and an aluminum brace (above). I was prescribed Percocet for the pain. Last week I went in for an upgraded cast (above), made of cotton padding and plaster tape. This cast is rigid and unfortunately won’t let my fingers reach my thumb (or vice-versa). This means I can’t hold a pencil, tie my own shoes, button a shirt, use tweezers… the list goes on and on. Eating with a fork is like something straight out of a Jane Goodall bloopers reel. Here's what my hand looks like under its hard candy shell. 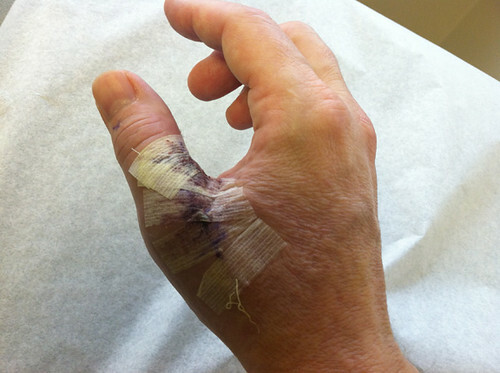 This was taken after the ACE bandage cast was removed, which explains the fabric texture on the back of my hand. Needless to say, Cool Jerk has been (and will be) on hiatus for the duration. I might try doing a strip with my left hand. Or maybe Darlene will do a fill-in. Or maybe one of you readers would like to draw a strip for me while I’m on the mend…? Thanks for understanding and for the well-wishes. I’ll keep you posted with the progress. I understand it’ll be months before I’m back to punching troublemakers in the throat.